Come check out this marketplace featuring local Bay Area makers. We'll be selling our nature inspired gratitude products - including our Gratitude Blooming card decks, postcards, and other goodies. While you're here, enjoy after-hours gallery access at the museum, DJ sets, music, dance, activities, delicious local food trucks and more! Gratitude Blooming: Simple Practices to Promote Reflection, Community, and Wellness. A presentation at the annual NASP Conference for student affairs educators. Come and visit our interactive, artistic booth and contribute to a “Wisdom 2.0 Gratitude Garden." You will be invited to share your unique responses to a thought-provoking prompt from the Gratitude Blooming card deck and make a fun memory in our photo booth! Join us for our monthly happy hour and popular open mic event to close out the year. Melorie Serrano Masacupan, founder of the Collective Healing Network will be curating our open mic with all of the things you love: storytelling, live music, spoken word, and maybe more magic tricks! Join the Gratitude Blooming team for a restorative weekend in nature, connecting with the plants, nourishing the body and soul, and gaining greater openness and clarity. Gratitude Blooming Art Opening / Happy Hour #10: Communities Unite! Join us for our first Gratitude Blooming Art Opening at the Octopus Literary Salon. Come meet the artist of the Gratitude Blooming cards, Arlene Kim Suda and enjoy live music from the amazing Nick Stone to celebrate our gratitude theme of COMMUNITIES UNITE! Join us at this Healthy Minds Healthy Schools Conference. Gratitude Blooming will be presenting on simple individual and community practices to support mental health in schools. Join us for our monthly happy hour with our first even open mic session curated by Melorie Serrano Masacupan, founder of the Collective Healing Network. We will have more of the things you love: storytelling, live music, spoken word. Emily Zisman and Barbara Eileen Murphy will be playing some songs to kick us off! Join us for this month's outdoor yoga class and coastal hike! This month our community yoga practice will center around our collective ABUNDANCE! Join us for another magical morning of yoga among the Redwoods with yoga instructor Liz Kelly. Gratitude Blooming Happy Hour #8: Cheers to Abundance! Join us for our monthly happy hour with poetry and live music from Naganagame, inspiring storytelling by SomosOne, and a group gratitude exercise to cultivate our collective abundance from 6:30-8:30 on Tuesday, September 4. Check back here on August 27th for this gratitude tea time, as Gratitude Blooming co-creator Belinda Liu and graphic designer Anca Mateescu discuss this month's topic of Friendship. This month we’re celebrating friendship, so grab a friend and come join us for another magical morning of yoga among the Redwoods. We will close the class with some live guitar music and a group gratitude practice. In this sacred practice, we will bring our awareness of the energy of the universe into a series of yoga asanas. You will learn techniques to fuse into your everyday life. We will close out the session with a shamanic journey into a state of higher consciousness. We will share cacao and council at the end. Fusion of Food + Yoga: "The Healing"
Come and learn how yoga and food can explain why you act and react to the things you do. By participating in this holistic-health yoga class, you will give your mind, body, and spirit a profound yoga tune-up (1hr), and by sampling delicious life-centering foods (vegan and gluten-free), you will learn why you desire certain tastes and textures. Gratitude Blooming Happy Hour #7: Celebrating Our Friendships! Join us in August for our Gratitude Blooming happy hour with Adam Rosendahl from LATE NITE ART as our co-host and featured storyteller, and live music woven throughout the night by Nick Stone. Think of a friendship that you cherish. What makes that friendship so special to you? Let's wind down our month of CELEBRATION by celebrating our wellness with a restorative Yoga Nidra practice with Bay Area yogi and leadership coach Melissa Lau. You will be gently led through a set of guided breathing and visualization practices that are designed to put you into a state of cellular and neurological balance.... wellness of the body, mind, heart and spirit! This gratitude tea time celebrates the beauty of random chance encounters. Shannon Mong met our team at a solar eclipse festival in Oregon last summer. As the Director of Innovation at Telecare Corporation, she shares her story of how celebration has become an important ritual in her personal and professional life. Happy Hour #6: Celebrating People, Places and Things! Summer is on its way and there's so much to celebrate in July! Join us for our monthly happy hour with live music, raw and inspiring storytelling with Nayad Abrahamian and an enriching gratitude game from 7-9 on Friday, July 13. How can you celebrate the people, places and things you are grateful for? Kick off the summer season with a sense of wellbeing, joy, and connection with a special outdoor solstice yoga class and group gratitude practice among the redwoods at Roberts Regional Park in Oakland. Belinda, founder and CEO of Gratitude Blooming, hosts a special guest each month for some real talk over tea. This month's guest is Liz Kelly, a Bay Area entrepreneur, author, yoga teacher and mother of two. Liz shares her unique perspective on "wayfinding" and connecting with the feminine face of god in her pursuit of life's infinite possibilities. End your workday with your favorite beverage, art, storytelling and some meaningful conversation with new and old friends!...We would love to hear your stories and explorations of infinite possibility! 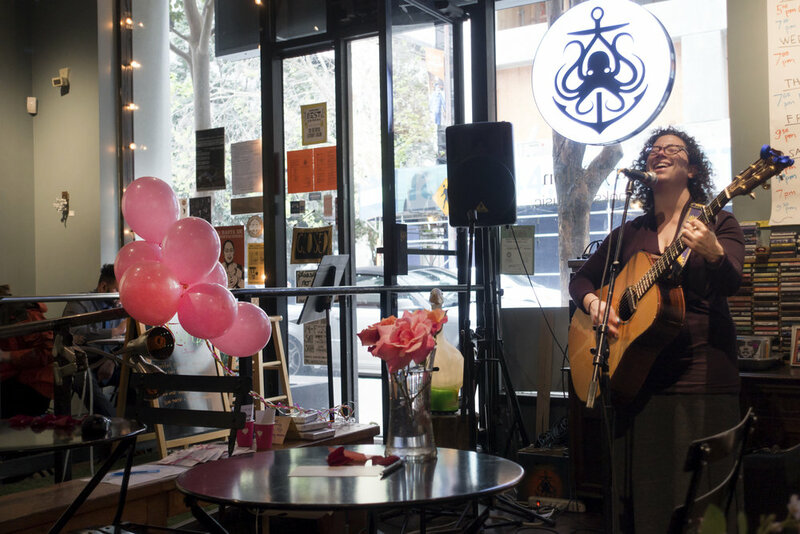 Join us for our monthly Gratitude Blooming happy hour at our favorite Oakland community spot, The Octopus Literary Salon, with live piano performances by N. Stone. Try being curious about something that feels uncomfortable to you. How can curiosity shed a light of understanding on something you fear? End your workday with your favorite beverage, art, live music and some meaningful conversation... We would love to hear your curious tales and explorations around navigating something you fear! You will leave with seeds of wisdom and inspiration from this beautiful community to take home with you! Free event - all are welcome!